HISTORY: SOMALI AIRLINES was the flag carrier of Somalia. It offered flights to both domestic and international destinations. 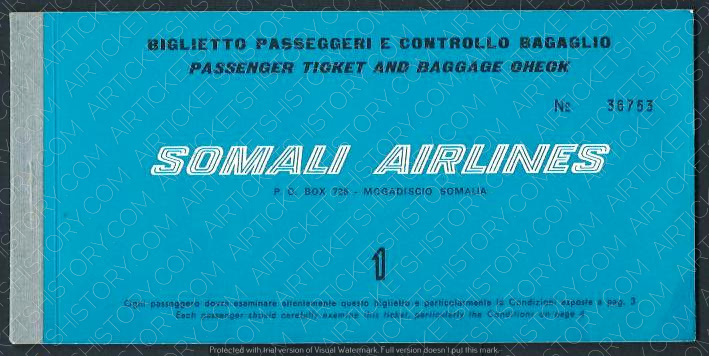 Somali Airlines was founded on 5 March 1964 as the newly independent Somalia's national airline. Due to the outbreak of the civil war in the early 1990s, all of the carrier's operations were officially suspended in 1991. The void created by the collapse of the airline has since been filled by various Somali-owned private carriers, such as Jubba Airways, Daallo Airlines and Puntair.